I’ve been thinking about what I’d like to say about Good Friday & Easter, and I’m still not sure, but I am going to write something, now. If you Google “Crucifixion story” and “Easter story”, you can find the 4 gospels’ accounts of these events, and in whichever translation you prefer. The things that are recorded as having happened just as Jesus was dying must have been difficult to ignore. I mean, there was an earthquake, the sky became dark, and the veil in the temple was ‘somehow’ torn in half. Oh, and let’s not forget that after the earth quake, several dozen graves were emptied as their residents came walking out, roaming the countryside. In fact, as Jesus died one of the Roman guards who had been involved in the brutal beating and Crucifixion, just hours earlier, fell to his knees and proclaimed that Jesus was indeed the Son of God. For several years, around this time of year, I liked to re-watch “The Passion of the Christ”. I know it’s not 100% Bible-based, but it’s accurate enough to make it’s point. It’s easily the most realistic account of the subject matter. I know my mind’s ability to minimize or exaggerate, and that’s why I want to be reminded of some of the gruesome and excruciating things He endured. For me, and for you. It’s been said that the devil’s best weapon to keep people out of church is the “Christians” who are already there. It certainly worked on me for a long time. The worst abuse I’d ever endured was at the hands of someone who CLAIMED to represent Christ. It was many (about 20) years before I could accept that most or all of the church-going men were not abusing their women. Today I know better. I looked at the humans sitting in the pews to be my examples of Christ, which was a huge mistake. As I felt myself being drawn (wooed, really) back to God, I determined that I wasn’t going to be fooled again. 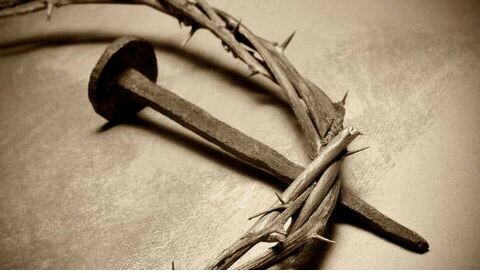 The crucifixion of Jesus Christ was proof of the lengths the Father will go to in order to show His love for us. I know it doesn’t make sense to a lot of folks, but it’s a heart thing, not a mind thing. Easter is my favorite holiday. It’s about second chances and new life. I hope you’re able to let God get close to you this weekend. He’s not what so many people make Him out to be. But don’t take my word for it. Ask God to show himself to you. He will.